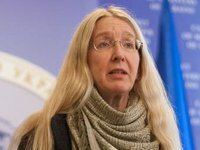 Several members of the Ukrainian parliament's health committee have appealed to Prime Minister Volodymyr Groysman with a demand to dismiss acting Heath Minister Ulana Suprun because of the treatment program for Ukrainians abroad, and the reorganization of the Center for Pediatric Oncohematology and Marrow Transplantation at the Okhmatdyt National Children's Specialized Hospital. Eight of the 14 health committee members spoke at a meeting in parliament, and later the government, on Wednesday. The lawmakers said the Health Ministry approved a UAH 389.9 million budget for a program to treat Ukrainians abroad in 2018 with the real needed budget estimated at UAH 692.3 million. After the allocated funds were spent, the Finance Ministry advised how to use under the program UAH 112 million earmarked – but not spent – on a pilot project for developing transplantation. The Health Ministry did not take the steps to do so, they said. In their statement, the committee members demanded re-opening the liquidated Center for Pediatric Oncohematology and Marrow Transplantation (which performed a coordination function), reinstating dismissed specialists and firing Deputy Health Minister Oleksandr Lynchevsky, who is responsible for the treatment program abroad. The lawmakers said the program should be funded in full and the Health Ministry should take measures to develop organ transplantation in the country. The MPs said they would send information about possible legal violations of Health Ministry officials to Ukraine's National Police. The Health Ministry, in turn, said redistribution of the UAH 112 million for the implementation of the pilot project to other programs "would jeopardize the development of transplantation in Ukraine." Deputy Health Minister Olha Stefanishina said earlier the ministry's 2018 budget request took into account the need for UAH 680.7 million for a treatment program for Ukrainians abroad, but has to date only received UAH 389.946 million in allotted funds. Commenting on the situation at Okhmatdyt, the ministry said that the marrow transplantation branch, which remained after the reorganization of the hospital, is working in the regular mode, Oleksandr Lysytsia is its acting head. All medical processes are unchanged and interrupted. The Center for Pediatric Oncohematology and Marrow Transplantation, established in 2002, had four departments before the reorganization - supporting chemotherapy with a day hospital, intensive chemotherapy, including chemotherapy of oncohematological diseases, marrow transplantation and a clinical laboratory. The Center is one of Ukraine's three medical institutions that perform bone marrow transplantation. According to the management of the institution, as well as the Health Ministry, the center was reorganized to expand opportunities for treating children by optimizing the organizational structure of the hospital and envisaged "disbanding the administrative unit, which was an unreasonable superstructure over the four departments and did not have any curative function." Critics argued that reorganizing the Center and separating its departments would impair communication with regional medical institutions which treat cancer patients.